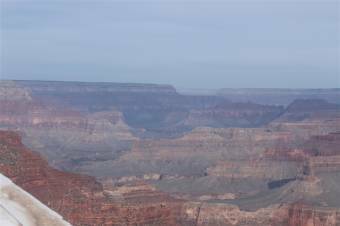 Webcam Grand Canyon - Yavapai Point, Arizona: View over the Grand Canyon - A nice panorama view from the Yavapai Point. Springdale, Utah: Zion Canyon Theatre, 75.9 mi. Zion National Park, Utah: The Temples and Towers of the Virgin, 76.3 mi. Kingman, Arizona: Hualapai Valley Observatory, 99.6 mi. Sedona, Arizona: Sky Mountain Ranch, 101.6 mi. Chino Valley, Arizona: Weathercam, 102.4 mi. Mesquite, Nevada: Virgin Valley High School, 103.5 mi. Prescott, Arizona: Burmister Building, 117 mi. Pine, Arizona: Rocky Top Ranch, 134.1 mi. This webcam Grand Canyon - Yavapai Point, Arizona with the theme Landmarks was added on December 27, 2004 and is operated by Grand Canyon National Park (National Park Service). It got 64974 visitors since then. Shouldn't this webcam work or should the link be wrong please report that here. You can add this webcam here to myCams.